My Facebook feed is full of people suffering from the flu. I’ve so far escaped but, with all the parades and events heading into Mardi Gras on February 13th, I need all the immune boosting I can get. I had thawed a chicken and decided that I’d do something that contained a lot of natural antibiotics – ginger, garlic, oregano, lemon juice. 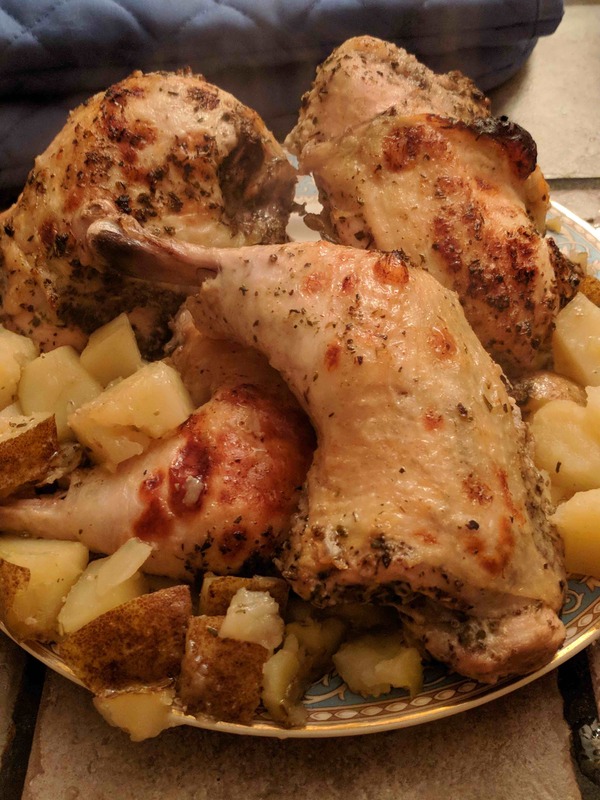 I altered my lemon oregano roast chicken recipe – the original called for dry white wine, for example and I replaced that liquid with ginger ale. If you can’t eat garlic, replace it with a tablespoon of minced ginger instead. Remove the backbone of the chicken and reserve for another use. Cut chicken into quarters and place in a zip top bag. Whisk together the lemon juice, ginger ale, olive oil, oregano, garlic, ginger, salt and black pepper. Pour over the chicken. Seal and refrigerate for at least 1 hour or overnight. Toss the cubes of potatoes with a little olive oil and spread them out in a shallow roasting pan. Roast for 15 minutes. Stir the potatoes around and add the chicken with its marinade, balancing the chicken on top of the potatoes. Cover with foil and bake for 30 minutes. Uncover and continue to bake for another 15-20 minutes or until the thickest part of the thigh reaches an internal temperature of 165 degrees F. Remove from the oven and let stand for 5 minutes before dividing among dinner plates. 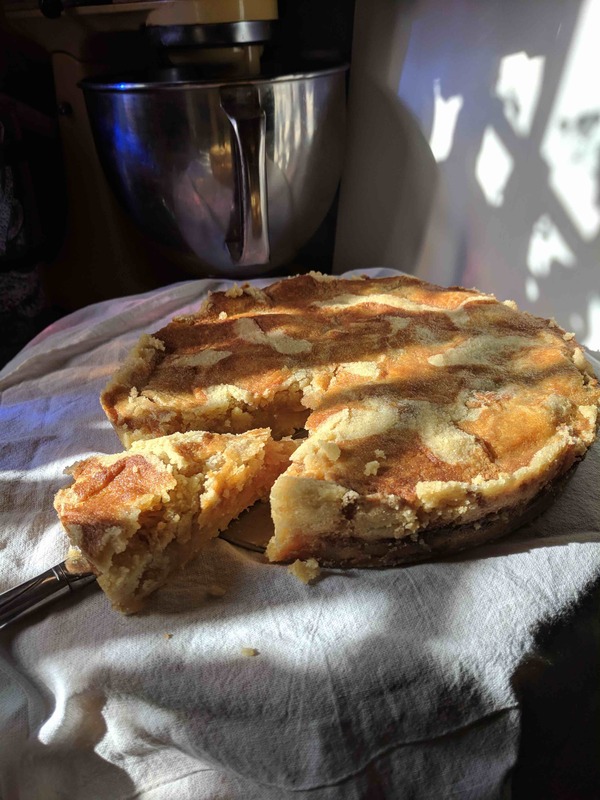 Here is a very easy cake recipe from the kitchen of Miryam Levy. Seems she had listened in on a conversation in French between two women sitting behind her on the 57 line from Haifa to Kiryat Bialik. And, voila, bus cake! My only addition was to toss the apples with a little cinnamon (1.5 teaspoons) for a little more flavor. However, the cake should be just fine without that step. I experimented with both red (Honey crisp) and green (Granny Smith). The sugar was a little much with the red ones but perfect with the tarter, green ones. The green apple cake, because the apples aren’t as juicy, had a lovely crunch along the edges as well. The red apple cake was more moist and dense, so it is really up to personal taste as to which apples you choose to use. Heck, I may try it again with a mix of apples! I also still had the grater out when doing the second cake and so I grated the butter for more even distribution on the top of the cake. The top picture is the red apple cake with sliced butter. The bottom picture is the Granny Smith cake with grated butter. Generously butter a round cake pan. Line the bottom with parchment and butter it as well. I used one tablespoon of butter on this step. Mix semolina, sugar, salt and flour together and pour half the amount into pan. Peel, core and grate apples. If desired, toss the grated apples with a little cinnamon. Evenly spread the apples over the first layer of dry cake mix. Pour the rest of the dry mix over grated apples. Slice or grate the butter and layer it over the top of the cake. Serve hot, topped with ice cream or whipped cream. I also had it cold the next morning with my tea and it was wonderful, too! As this recipe doesn’t use eggs, substitute margarine for butter and you’ve got a terrific vegan dessert! It seems that every southerner I know has a cheese straw, cheese nibble, or cheese wafer recipe. 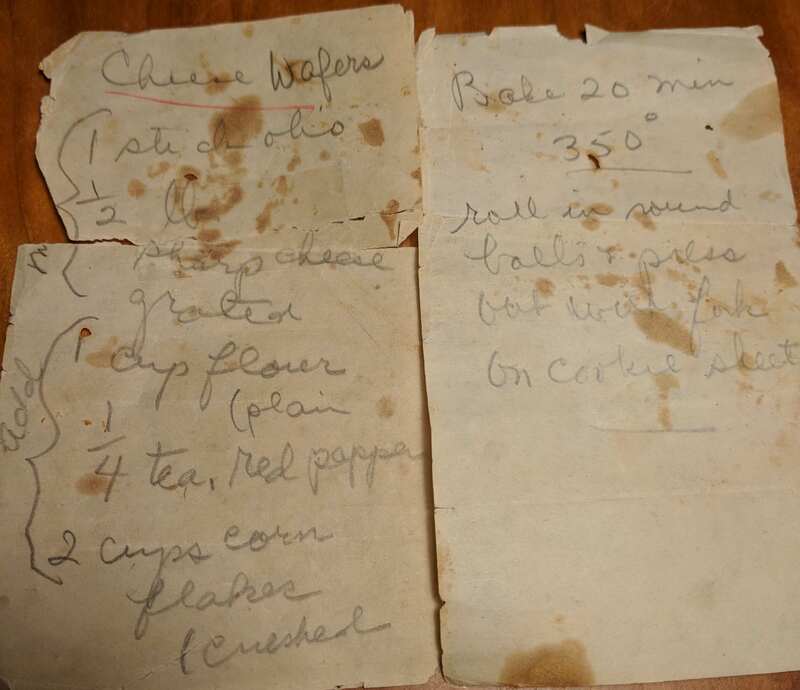 In fact here are links to just a few (here, here, here) plus I’m including a picture of my family’s recipe from my maternal great-grandmother. I’ve been lucky that Michelle has been working on perfecting her recipe. 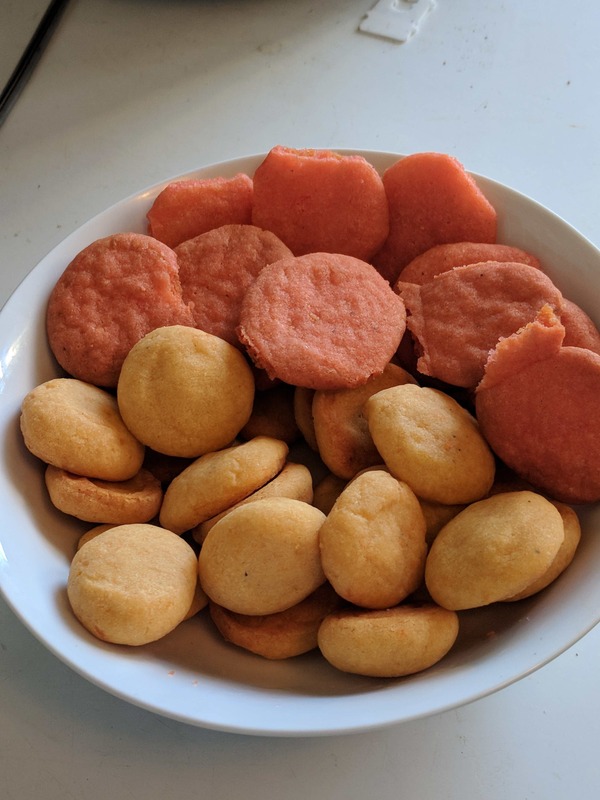 In the below picture, she added a little more flour to the puffy yellow ones (and a little red food coloring to the others to tell the difference). There wasn’t enough crunch, so she extended the cooking time and the result were very tasty! I recommend tripling the recipe but, as most mixers can’t handle such a heavy batter, do each batch separately. In a large bowl, sift the flour with the spices. Gradually add the seasoned flour to the cheese mixture by large spoonfuls, beating well after each addition. Roll batter into nickle sized balls and press down on baking sheets with your thumb. Bake for about 15 minutes in a 350 degree F oven until bottoms are slightly browned. 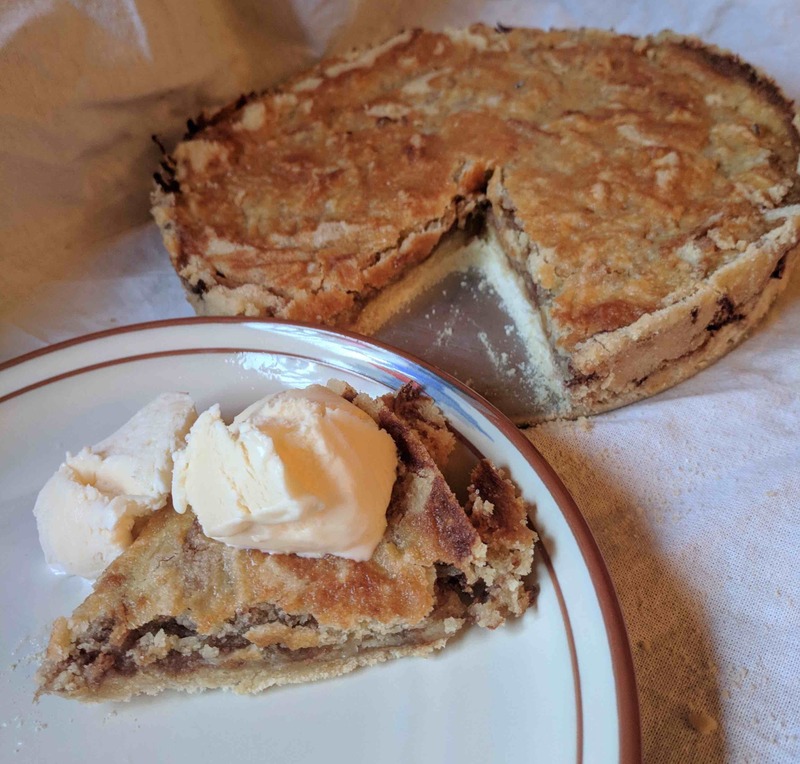 Alternatively, you could place a portion of the dough into a cookie press fitted with the star tube and press the dough onto a cookie sheet in three inch strips. Repeat until the pan is full. Bake until straws are golden brown and crisp. Cool on pan 5 minutes before transferring to a wire rack to cool completely. Serve immediately or store in an airtight container. For longer storage, place the airtight container in the refrigerator or freezer. To recrisp cheese nibbles that have been stored, bake for 5 minutes at 350 degrees F.
Time for more quick, no-bake desserts. This one is a little messy but the darker chocolate compensates for the sweetness of the cereal. The recipe calls for 8 cups of cereal but I just used the entire 12.5 ounce box and an entire bag of bittersweet chocolate chips. Place cereal in a large bowl. Melt chocolate and peanut butter in a double boiler. Let cool slightly and then pour over the cereal. Stir gently until everything is well coated. Pour onto a baking sheet and let the chocolate set for an hour. In a large paper bag, place 1/4 cup powdered sugar. 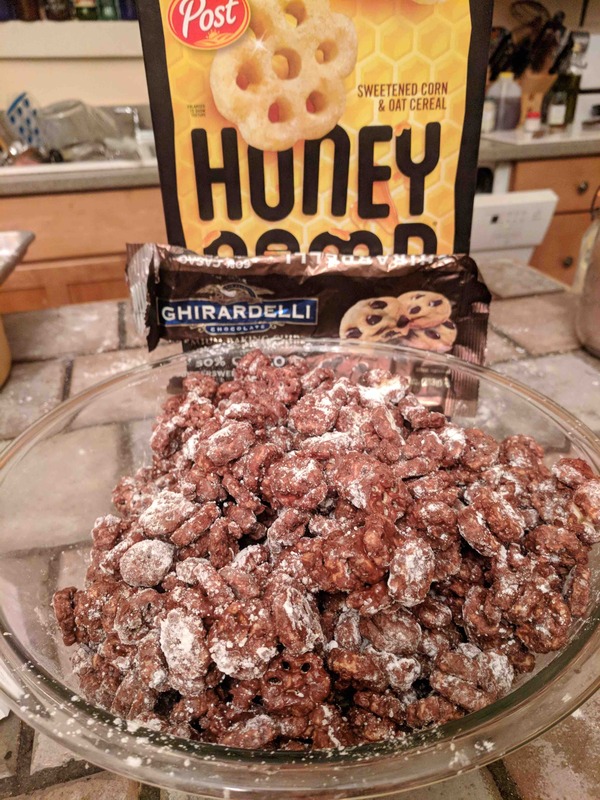 Dump in the chocolate covered cereal into the bag and shake out another 1/4 cup of powdered sugar on the top. Shake vigorously until sugar coats the pieces. Pour out onto a large baking sheet and let cool completely before putting in zip top plastic bags. We’ve been under a hard freeze here in New Orleans – last night we were even cut off from all sides as bridges and interstates froze. The Causeway, the Bonnet Carre Spillway, the Twinspan, the High Rise were all closed due to winter weather conditions. As I got up in the night to check that the pipes under my elevated house didn’t freeze, I decided to spend the next day making soup. I pulled from the freezer chicken stock and chopped onions to thaw. This morning, I started a pound of beans to soak and then later warmed my house by caramelizing the onions in the oven. I did wait until mid-afternoon for things to warm up a bit in order to harvest some fresh rosemary, though. This is a very easy soup to put together and delicious to eat. 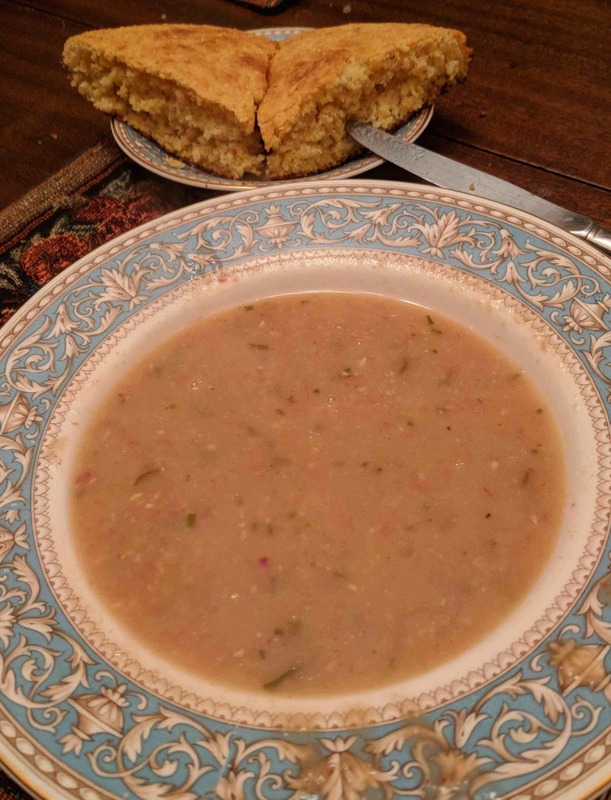 I served the soup with cornbread. In a medium bowl, cover the beans with water by at least 1-inch and leave them to soak for 6 hours or overnight. Preheat oven to 400 degrees F. In a large stockpot or Dutch oven, stir together the onions with the olive oil. Cover and put the pot in the oven for 2-3 hours to caramelize the onions, stirring every 15 minutes until the the onions have deepened to the desired color. It took 2.5 hours for mine to reach tawny. Add the garlic and cook for an additional 15 minutes. Remove the stock pot from the oven and place over medium high heat. Add the drained white beans, rosemary, chicken stock, and bay leaf. Cover, bring to a boil, and then reduce heat to simmer for an hour or more, until the beans are very soft. Remove the rosemary and the bay leaf. Pass the soup through the coarsest blade of a food mill, or place in the bowl of a food processor or immersion blender and pulse until coarsely pureed. Return the soup to the pot to reheat and add salt and pepper, to taste. Serve hot. We started the morning with some Monkey Bread (from the freezer section of most grocery stores) but that was way too much sugar to satisfy us for long. 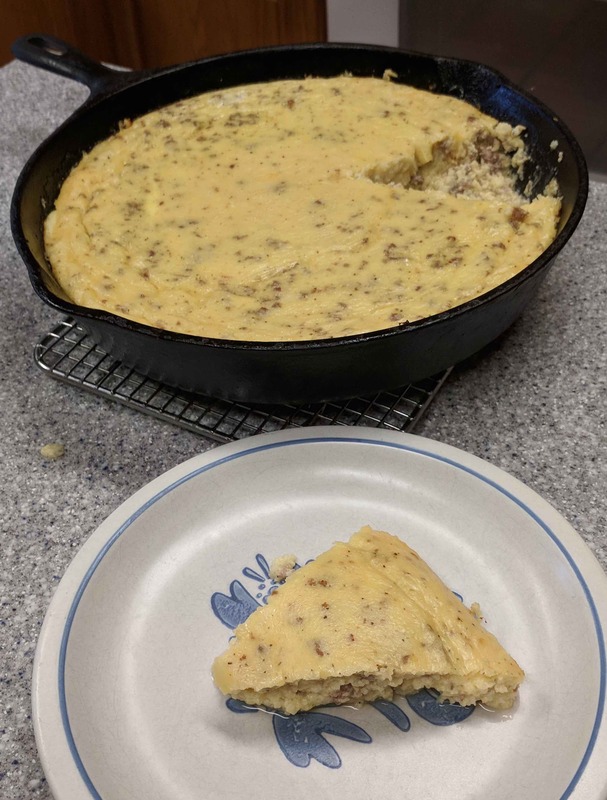 I made up a terrific skillet dish for brunch – filled with sausage, grits, cheese and eggs, it is very satisfying and delicious. If you wanted a nicer presentation, you could cook it in a 9×13 casserole dish. 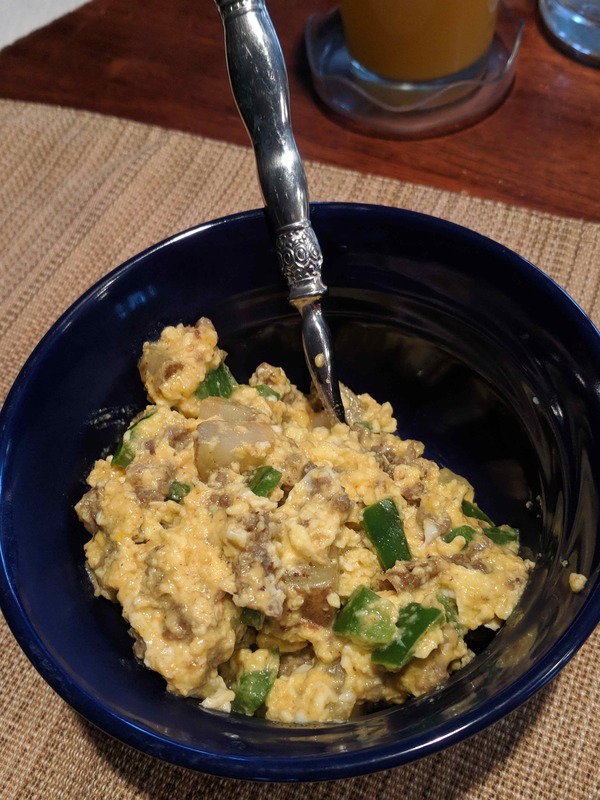 1 cup grits – not instant! Brown the sausage in a large, 12 inch cast iron skillet. Drain off the grease. Bring water, broth and 1 cup milk to a boil – with one cup of grits, you will need 4 cups total liquid to boil it in. Whisk in the grits and the salt. Stir regularly until grits are cooked. Slowly add in the cheddar cheese by the handful until it is all melted together. Beat the eggs with the remaining cup of milk and the black pepper. Slowly stir egg mixture into the grits. Stir in the sausage and the transfer the casserole back to the cast iron skillet. Slide the skillet into a preheated 350 degree F oven and bake for 50 minutes or until a knife inserted in the center comes out clean. Let stand for 10 minutes before serving.